The Goldland Millenia Suites is perfectly located for both business and leisure guests to Manila. All hotel's guestrooms have all the conveniences expected in a hotel in its class to suit guests' utmost comforts. 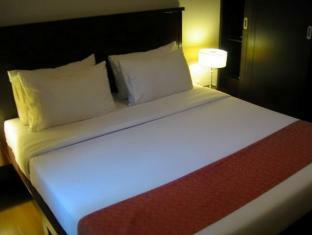 Each guestroom is tastefully appointed with non smoking rooms, air conditioning, bathrobes, daily newspaper, desk, hair dryer. This Manila accommodation features on-site facilities such as shops, elevator, coffee shop, laundry service/dry cleaning, meeting facilities. Hotel's guests can experience on-site latest leisure and sports facilities such as massage, indoor pool, pool (kids), gym, tennis courts, spa. This hotel is characterized by a combination of modern comfort and traditional element of Manila, making it a distinct accommodation. To proceed with your booking at the Goldland Millenia Suites, simply choose your travel dates and fill in our secure online reservation form.